Arrogance: I'm talented, roll out the red carpet for me. Humility: I'm talented and get to stand on the shoulders of giants. Arrogance: You're lucky to work with me. Humility: I'm lucky to get to share the work I love. Arrogance: My work has the power to change the world, hence the end justifies the means. Humility: My work has the power to change the world so 'how' I do things matters. 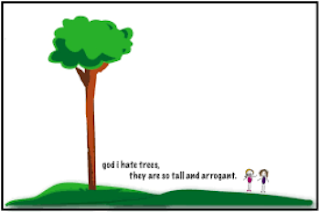 Arrogance: Everything everyone else does is inferior. Humility: Look at the community of talent. Arrogance: What's in it for me? Humility: What's the larger good? Arrogance: I want to have it all. Humility: I want and will make room for what's important. Humility knows there are more than two sides to every story. Many of us mix these up but make no mistake: arrogance is synonymous with insecurity, true humility is synonymous with confidence. If you want to be better, own your talent. Acknowledge that what you offer is worth something. True humility does not hide its gifts.